You no longer have to settle for wearing just one of your favorite colors at once; this spring join the color blocking party and have fun wearing multiple favorites all at once. The color blocking trend is easy and doesn't take much effort or thought. Color blocking means pairing one bright color with a contrasting one, or a pastel with a contrasting pastel. When color blocking, make sure not to mix more than two to three colors at a time, in order to avoid looking clownish. 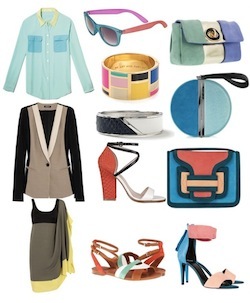 Spring is the perfect time to start this trend and color blocking is easy to work into your existing wardrobe. Get creative with your color blocking and try different combinations that work for you. For example, pair your jean shirt with a pair of red jeans, or a red top with blue jeans. Another way to color block is to wear a bold color on top with a similar color on the bottom- hue on hue but with different shades. Not comfortable with wearing such bright colors on top and bottom? Try pairing your color with black for a more low key version of color blocking. Or go for the hottest color blocking story this season, black and white. One of the biggest trends for spring is black and white together. Luckily, designers took the guessing out of color blocking this season and did it for us! Designers already color blocked dresses, sweaters, tops and skirts. Experiment with this trend and see what colors work best with your personal style. Color blocking is a great way to stay on trend while adding a little color to your wardrobe. If this all feels too adventurous for you, try a color blocked accessory. Give your outfit a pop of fun with a color blocked shoe, glasses, bracelet or bag; this is a great way to incorporate color blocking into your everyday look. Caroline Rahmey is a fashion designer who lives in NYC with her son and husband. Caroline went to FIT and later launched her clothing line, Caroline Hedaya. Caroline recently started Nine Month Project, a fashion/lifestyle blog that helps motivate pregnant women to feel and look good. To read more about Caroline and her pregnancy fashion tips, click HERE.